These teams have been tasked with developing and agreeing the common processes to be used in the implementation of SC21. The SC21 Steering Board provides the overall guidance, direction and priorities of the SC21 programme within the Aerospace and Defence Sector. It is responsible for reviewing the annual objectives, ensuring that all of the interests of the SC21 programme are represented and will therefore include all levels of the Supply Chain, Government & external stakeholders. In the past the PDQ SIG was separated from the Collaborative Working Group Special Interest Group (CW SIG), now they are merged together into one. The PDQ SIG is chaired by Industry. Its objective is to act as the focal point for all performance and development work under the SC21 programme. It ensures that the performance, development and quality guidelines for implementing supply chain performance improvement are successfully implemented across the supply chain. It also includes governance of toolkits such as Business Excellence, Manufacturing Excellence, Relationship Excellence, and ensuring Quality and Delivery Performance Indicators are valuable for Industry. 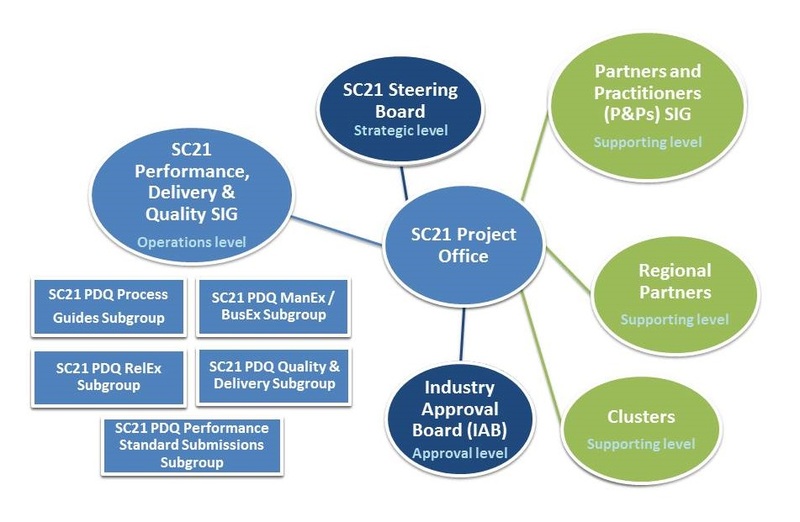 The SC21 Industry Approval Board evaluates all the SC21 performance standards requests. It ensures that the organisations participating to the SC21 programme and achieving and maintaining agreed criteria in terms of delivery, quality, sustainable improvement and the associated improvement frameworks (Business, Manufacturing and Relationship excellence) receive recognition in the form of a Bronze, Silver or Gold performance standards. The IAB Board refers to the SC21 standards, established from the PDQ SIG.